Re-leveling a Slab With Grout: A Short-Term Solution? 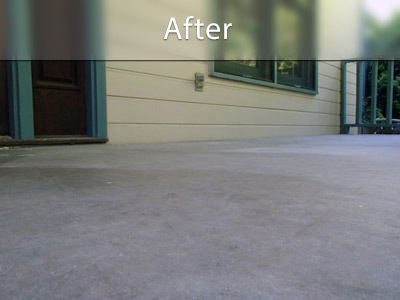 There are several ways to re-level a concrete slab, such as a sidewalk, pool deck, patio, or driveway. They include mudjacking, polyurethane foam injection, demolition and replacement, and the use of re-leveling grout. The latter has a lot of appeal. It doesn’t require a lot of material or expensive equipment – and is relatively inexpensive. Re-leveling a concrete slab by applying a new layer of concrete has its drawbacks. First, new concrete does not bond well to old concrete. Scrupulous surface preparation and a scratch coat, fortifier, or bonding agent will be required. Even then, harsh winters with their freeze-thaw cycles, will open cracks and cause the cap layer to break. If the existing slab surface has been subject to oil leakage or tree sap, or if it has been painted, its bond with the new concrete will be weak. More importantly, adding more weight to a sidewalk that is already too heavy for the underlying soil will most likely only be a temporary fix. The sidewalk may continue to sink and shift after only a few seasons, causing you more headaches and costing you even more money for repairs. PolyLevel® technicians have a better solution for concrete re-leveling needs. Contact your local contractor and schedule a free estimate! 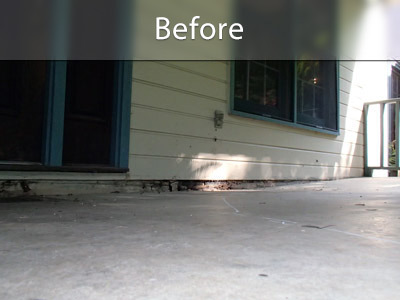 This homeowner could have chosen to re-level the sunken portion of this concrete deck and risked continued sinking. Instead, PolyLevel® was used to raise the existing concrete and to consolidate the supporting soil. Re-leveling using the PolyLevel® System is a long-term solution to slabs that have sunken due to soil settlement or washout. The foam is light weight but can support heavy loads. Its lifting power is greater than traditional slab-jacking methods, such as mudjacking, or other concrete leveling methods. As a bonus, the cure time is fast. You can drive over a concrete driveway that has been raised in as little as 15 minutes after the injection is complete. And best of all, the PolyLevel® concrete lifting repairs are nearly invisible. Injection holes are about the size of a penny. We offer Free Estimates on grout re-leveling and PolyLevel® jobs, contact us today!